When a task is initially assigned, the default behavior of the portal is to send a popup notification to the assignee(s), in addition to an email containing the task name, description, and an assignment link. A follow up email can be sent after a set time period if the assignee(s) have yet to take action. This example will configure a reminder email intended to go to the original assignee after 48 hours of inactivity on the task have elapsed. This flow is a reusable flow that can serve as a reminder email flow for all task assignment. The example uses the Warn	date for taking action, however the Late	or Escalate	date options could be used following the same pattern. To begin setting up the reminder email, click on the form that handles the task assignment. In the Assignment	Properties	panel, underDates	select the Specify Warn Date	checkbox. A Form Assignment Warn Date	drop down will appear. This drop down list contains several options that we will use later to set our assignment warning data. 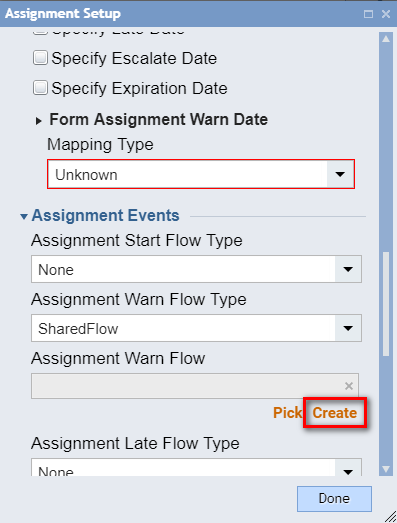 Under Flows > Assignment Warn Flow Type	drop down list**,**	select whether or not the Assignment Warn	Flow	should be a SharedFlow	or Private	flow. In this case we will use a SharedFlow. Select the Create	link to create a new flow. Name the new flow Send Reminder Email	and click OK	. In order for this flow to have context for the assignment, it is necessary to manually set the Assignment	data on the Start	step of the warning flow. To do this, double click on the Start	step and click Add	under Flow Input Data	select Show Editor	to add new input data to the flow. Enter Assignment Information	in the name field, and select Assignment	as the data type. Click Close	. Now our flow is aware of the assignment created in the parent flow. Drag the outcome path of the Start	step to open the quick add window. Under All Steps [Catalog] > Communication,	select the Send Email	step and click Add	to add it into the flow. Click on the Send Email	step. From the Properties	panel, enter the from address in theFrom	field. You can use the Build Array	mapping type to build a list of To	addresses. In this example, only one user is assigned, therefore we&apos;ll only pass in the collection of users. Change the Email > To	field mapping type to Select Value	. Click the Pick	button and select AssignmentInformation > AssignedUsers	and click OK	. In the Email > Subject	field, keep the mapping type as Constant	and enter Task Reminder	. We have several ways that we can configure the body of the email. In this example, we are going to use a Text Merge.HTML. Under the Body	properties of the Send Email	step. Click the drop down and select Text Merge.HTML. Click on Show Editor	for the Email > Body	field. Expand the Assignment Information	collection of data. Enter a message for the reminder email, dragging and dropping data from the Assignment Information	list to the left into the message body on the right. These fields will populate with the values from the task. Click OK	when complete. The Send Email	step is now configured. Connect the Send Email	step to the End	step to complete the flow. Save, close, and return to the flow that generates the assignment. In this example, the Form Assignment Warn Date	will be configured to be 2 days in the future from the date of the task&apos;s assignment. Under Form Assignment Warn Date	, change the mapping type to Compute Date	. Set the Compute Type	field to InFuture	. Change the Offset	field mapping type to Constant	and set the value to 2	days. Click Done. Ensure that the Send Reminder Email	flow is selected in the Flows > Assignment Warn Flow	field. The configuration of the reminder email is complete. The workflow will execute and send the task assignee an email containing the details of the original task if it has not been work in two days.